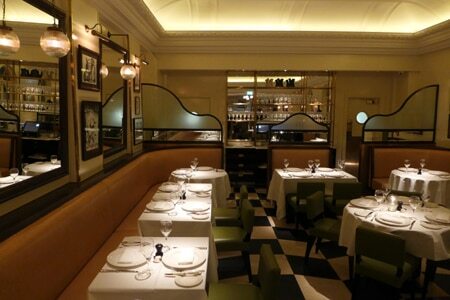 French cuisine inspired by the chef, restaurateur, author and TV presenter Marcel Boulestin. : Restaurateur Joel Kissin made his mark on the London dining scene in the 1990s, and now he's back with Boulestin, located in a 17th-century building in posh St. James's that previously housed L'Oranger. The restaurant pays tribute to Marcel Boulestin, the French chef, restaurateur, author and TV presenter who had a strong culinary influence on England in the 20th century. In the front is the casual Café Marcel, which serves its own menu from breakfast through dinner. Beyond it is the bar and the bistro-style dining room, Boulestin. There is also a courtyard for outdoor dining and a private room downstairs. The menu draws inspiration from Boulestin's cookbooks and offers classic French dishes such as snails with ceps and roast bone marrow, Toulouse sausage, and duck confit. Ingredients sourced from Great Britain are proudly labeled, as with the sweet-cured herrings from Scotland and seabass from Newlyn, Cornwall. Among the mains, the roast turbot with carrot and ginger sabayon is an interesting option. Desserts may include baked Alaska or a chocolate and pear tart. As expected, the concise wine list has a French accent but there is plenty of representation from other parts of Europe. Cocktails primarily stick to the classics. Set pre- and post-theatre 2 courses £24.50, 3 courses £29.50.